That’s it! Add on the included accessories or make your own. 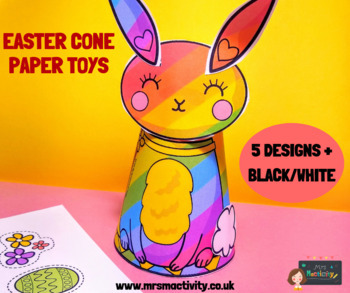 These Easter cone toys come in 5 different designs, in colour and black/white – so 10 Easter cone crafts in total. Choose black/white to save on ink and personalise yourselves, or choose colour for a quick craft with maximum effect. Explore the rest of our Easter activities here.